Not to be a harbinger of doom here, but this is a number that clearly illustrates: a) the overall problems with the United States housing market and b) the overall problems that Countrywide Financial (CFC) has. To give you an idea, Countrywide Financial currently has 14,196 homes listed for sale on their website. Now, Countrywide Financial is the biggest mortgage company in the United States. So, these homes that are listed are foreclosed homes that Countrywide Financial now owns because the borrowers defaulted on their payments. To illustrate the growth in foreclosed homes listed on their website, at the beginning of 2007, there were less than 5000 foreclosed homes listed for sale on their site. So over the course of one year, there has been a tripling in the number of foreclosed homes that have been subsequently listed for sale. Not good news for Countrywide Financial, and certainly not good news for the American housing market. An increase in the number of foreclosed homes will just depress real estate values, as there will be much more supply on the market. California is the state with the most foreclosed homes on the market with 3,803 homes, amounting to a total value of over 1.2 billion dollars. And this is just one company. There are scores of banks that are currently holding Bank Owned Properties. The total value of homes that CFC is currently holding is just under $3 billion dollars, for a grand total of 14,196 homes. California and Florida have been two of the worst hit states, with Florida's foreclosed home count increasing by 700% and California's count increasing by almost 800% in the past year. Many people were upside down in their mortgages, so they just decided to walk away from their homes and let the bank foreclose on them. This stems from a number of different reasons, including over-aggressive lending policies. 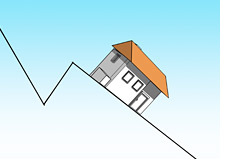 The housing market can not start to recover until we see a marked decrease in the number of bank owned properties, and this will only happen when the housing market declines to a point where the values are palatable for potential purchasers.